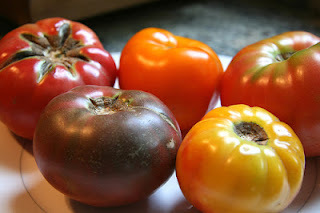 Did you eat your share of Heirloom tomatoes this summer, or maybe still eating them?! They have been simply fantastic and I haven't been able to get enough of them! Every Saturday I've found myself carrying home a brown paper bag filled with the most beautiful, imperfect and vibrant little jewels just begging to be paired with fresh mozzarella and basil, fresh from the garden, of course. Honestly, I had never really paid much attention to Heirloom tomatoes prior to spending a lot of time in Italy over the past decade. Growing up and living in California for most of my life, you would think I might have had more knowledge of this famous fruit (yes, a fruit). But until the flourishing of local, sustainable farmers markets came onto the scene over the past years, finding heirlooms was more of a treasure hunt rather than a profuse "find." When it comes to taste...I discovered this fact - "Heirloom tomatoes lack a genetic mutation that gives tomatoes an appealing, uniform red color while sacrificing the fruit's sweet taste. Varieties bearing this mutation, which have been favored by industry since the 1940s, feature fruits with lower levels of carotenoids and a decreased ability to make sugar within the fruit." It's also important to realize there's a very serious movement around and behind the preserving of seeds given the tragic influx of GMO crops, plants, etc. taking over our Nation's food source. I have a definite and strong opinion about my food and it's origins, but I'll save that story for a future blog post! Here's a wonderful and simple recipe for a delicious Heirloom and feta cheese salad that's still perfect for these "dog days of summer"...it's still summer in the west, so enjoy! Cut tomatoes into thick wedges and serve with your favorite feta cheese, some snipped chives, and plenty of cracked pepper. I also love to drizzle this salad with a great olive oil and some fig balsamic - Yum!! The word tomato derives from a word in the Mexican Nahuatl language, 'tomatl'.